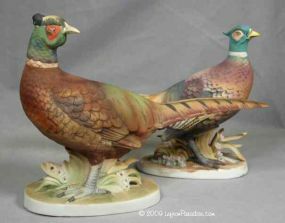 Pair of Pheasant Figurines - KW769 Discounts Apply ! A realistic pair of pheasants, the male stands 8 inches tall and is 5½ inches long. The hen is slightly smaller. There are some tiny applied flowers on both bases. They have no flaws. Marked KW769 with a color crown. There had been a sticker on the base, but there is only a tiny bit of glue residue left.